राष्ट्रवाक्य: "एकता, अनुशासन और मेहनत"
The regions are further divided into 58 departments. 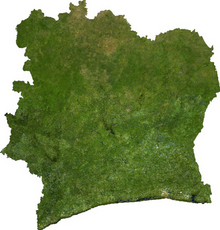 Côte d'Ivoire is a country of western sub-Saharan Africa. It borders Liberia and Guinea in the west, Mali and Burkina Faso in the north, घाना in the east, and the Gulf of Guinea (Atlantic Ocean) in the south. The country was originally known in English as Ivory Coast. In October 1985 the government requested that the country be known in every language as Côte d'Ivoire, without a hyphen between the two words (thereby contravening the standard rule in French that geographical names with several words must be written with hyphens).